For other uses, see Hermit Thrush (disambiguation). This species measures 15 to 18 cm (5.9 to 7.1 in) in length, spans 25 to 30 cm (9.8 to 11.8 in) across the wings and weighs 18 to 37 g (0.63 to 1.31 oz). Among standard measurements, the wing chord is 7.8 to 11.1 cm (3.1 to 4.4 in), the bill is 1.6 to 1.9 cm (0.63 to 0.75 in) and the tarsus is 2.7 to 3.3 cm (1.1 to 1.3 in). It is more compact and stockier than other North American Catharus thrushes, with relatively longer wings. The hermit thrush has the white-dark-white underwing pattern characteristic of Catharus thrushes. Adults are mainly brown on the upperparts, with reddish tails. The underparts are white with dark spots on the breast and grey or brownish flanks. They have pink legs and a white eye ring. Birds in the east are more olive-brown on the upperparts; western birds are more grey-brown. Walt Whitman construes the hermit thrush as a symbol of the American voice, poetic and otherwise, in his elegy for Abraham Lincoln, " When Lilacs Last in the Dooryard Bloom'd,"  one of the fundamental texts in the American literary canon. "A Hermit Thrush"  is the name of a poem by the American poet Amy Clampitt. 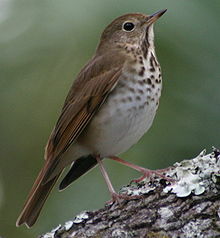 A hermit thrush appears in the fifth section ("What the Thunder Said") of the T. S. Eliot poem The Waste Land. ^ BirdLife International (2012). "Catharus guttatus". IUCN Red List of Threatened Species. Version 2013.2. International Union for Conservation of Nature. Retrieved 26 November 2013. ^ Jobling, James A (2010). The Helm Dictionary of Scientific Bird Names. London: Christopher Helm. p. 111. ISBN 978-1-4081-2501-4. ^ a b Brahic, C. (2014-11-04). "Thrush's song fits human musical scales". New Scientist. Archived from the original on 2014-11-05. Retrieved 2014-11-04. ^ Doolittle, E.L.; Gingras, B.; Endres, D.M. ; Fitch, W.T. (2014-11-03). "Overtone-based pitch selection in hermit thrush song: Unexpected convergence with scale construction in human music". Proceedings of the National Academy of Sciences. 111: 16616–16621. doi: 10.1073/pnas.1406023111. PMC 4246323. PMID 25368163. ^ Whitman, Walt. "When Lilacs Last in the Door-yard Bloom'd". Bartleby. Retrieved 2008-07-26. ^ Clampitt, Amy. "A Hermit Thrush". The Academy of American Poets. Retrieved 2008-07-26. Wikimedia Commons has media related to Hermit thrush. "Hermit thrush media". Internet Bird Collection.